Recently out of private beta, Scoop.it is a curation tool that’s made for sharing. 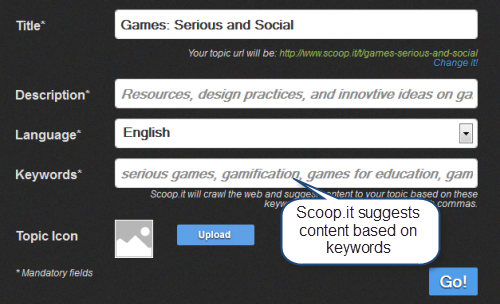 Scoop.it allows users to gather and display content in an appealing format and publish it on the Web. Creating a page for a topic you want to curate is easy. You just follow a series of prompts. Define your keywords with some care since Scoop.it will suggest content based on these. You can add the suggested content to your page, discard the content, or remove the source (if you don’t view it as reliable, for example). However, you also can add content you find on the internet using the Scoop.it bookmarklet. You can add a description or reflection and post this to your page. You can use an image already on the Web page or you can add your own. Don’t forget to scroll to the bottom of the page to find the link to “Goodies.” You’ll be able to grab code for widgets to embed a slideshow of your curated content on your Web page. There are also widgets that allow you to provide links to your Scoop.it profile. You can learn more about Scoop.it by watching this video. This Slideshare also highlights some new developments. Scoop.it makes it easy to curate content and the prompts provided by the bookmarklet reminds you to add a reflection rather than merely posting a page as is (although you can always do that as well). 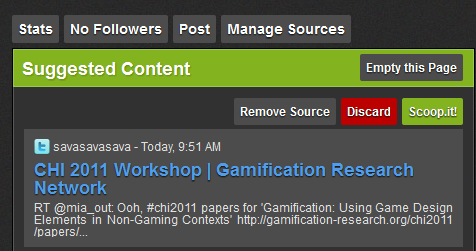 It allows you to post content to your personal social learning network (e.g., Twitter, Facebook, etc). It also allows you to expand your personal social network by making it easy to follow other curators and obtain RSS feeds to their content. 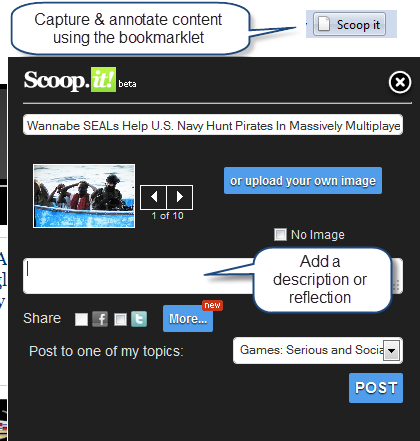 If you are using Scoop.it as an instructional tool, the ease of posting to Scoop.it can almost be too seductive, so you should encourage learners to personalize their Scoop.it pages in a way that requires them to read and think about the content they’re posting.